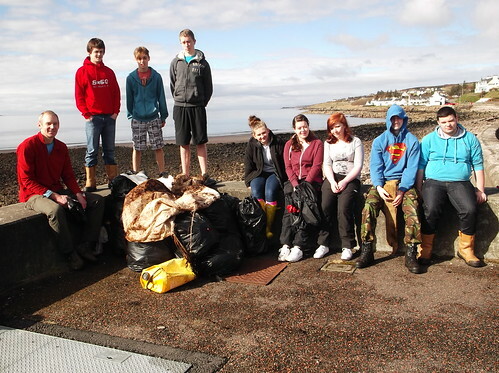 Beach Clean – This is now the eleventh year that Gairloch High School pupils have cleaned the beach between Strath and The Myrtle Bank Hotel. They managed to collect over 50 sacks of rubbish in the first clean up. This year, the beach was covered in more rubbish than in any year since that first one. S5/6 Outdoor Education pupils spent some time on Wednesday morning and S1 SMART pupils spent Wednesday afternoon cleaning the beach as far as the pumping station. They have made a brilliant job! We plan to clean the section from the pumping station to the river on Wednesday afternoon and welcome any support from the community – gloves and sacks can be provided! Click on the photo to see more images. S1 pupils were also out in January cleaning the beach below the graveyard. Click for photos. Duke of Edinburgh’s Award – Former pupil Mags Mathieson has just achieved her silver award. Nikki Goldby, S4, has achieved Bronze. Well-done girls! One Red Nose – On 21st March, GHS Drama Club performed a collection of short scripted and devised scenes. We chose plays which were happy and others which were a bit sad, to show both sides of Comic/Sports Relief. Helen Peat, our wonderful drama teacher, found 3 comedy plays and we wrote 3 serious plays ourselves. The plays were: “The Audition”, “The Waiting Room”, “A Day in the Life”, “Cube Farming”, “Casual-ty” and “Ever Decreasing Circles”. Maia Mackenzie also performed two songs, “Your Song” by Elton John and “Little Talks” by Of Monsters and Men. We managed to raise £152, which we will donate to Sports Relief. Now we have quite a few more people coming to our weekly drama group, which is great because we can perform bigger plays! Sport Relief – On 20th March pupils organised a one-mile walk around the school at lunchtime. Staff and pupils raised £115.48. Carys Townsend and Eilidh MacDonald also raised £100 by selling squares on a prize draw. Well done to all! Art Exhibition – The S2 Self Portrait Exhibition is running until April 2nd in the GALE Centre. See if you can recognise our S2 pupils from their portraits by visiting the show! Donation of Outdoor Equipment and Clothing – We recently received a donation of equipment from Mrs Joan Smith, Derby. Her husband died recently and she has kindly passed on a selection of protective clothing and rucksacks. Through their daughter, Mrs Hilary Crick, Beauly, they had heard of our Outdoor Activities and we have been fortunate enough to be gifted the equipment to support the activities of the pupils. Thank you! Pupil Success – Alasdair MacDonald recently took part in the Inverness Music Festival. Alasdair received a first place with Distinction in Advanced Accordion. In the Open Competition he came second with an Outstanding. Well-done Alasdair! S1 Bring and Buy – With additional funds collected the S1 pupils finally raised just over £2000 at their Bring and Buy. The pupils would like to thank the following local businesses for their support: Inverewe Garden, Paul Tattersall, Gairloch Trekking Centre, Button Bothy, The Shieling, Shieldaig Bar & Coastal Kitchen, Loch Torridon Smokehouse, Landmark, Kenneth Morrison’s Butchers, Isle of Ewe Smokehouse, Beautopia, Aultbea Stores, Cornerstone, Dentist, Gairloch Pantry, Kenny Tallach (Argocat), Aultbea Hotel, Myrtle Bank Hotel, Eddie Ritchie, Torridon Sea Tours, Bridge Cafe, Ewe Canoe, Poolewe Shop. Click here for some photos. Judo demonstration – For the last three years, during P.E. lessons, Mr Hulme has been giving pupils five-week taster sessions to learn a little about judo. As he has not had another person with knowledge of the sport to work with, this has limited the range of judo that could be demonstrated. For this reason, Mr Hulme arranged with Mr N. Shepherd, a fellow member of Invergordon Judo Club, to give a demonstration of the various techniques that make up the sport. In front of the whole school, the two ‘judoka’ displayed throws, hold-downs, strangles and arm-locks. The pupils particularly enjoyed seeing Mr Hulme strangled! The session concluded with a brief bout of contest fighting and the opportunity for questions. It is hoped that some pupils will have been intrigued by what they saw and take up the sport should the opportunity arise in the future. 50 Days to Fit – By the time you read this, the 5×50 Challenge will be underway. We hope that the 138 members of the GHS team are enjoying their more active lifestyle and are contributing lots of kilometres to the team total. The Activity Tourism class just have a few reminders for you all: remember to get friends and family to sponsor you in your efforts; remember to log your activity every day and post comments and pictures to https://www.facebook.com/GairlochHigh5x50; and lastly, remember the prizes – greatest distance, most sponsorship raised and most innovative 5K! Important Dates – Available on the school website. School re-opens after Easter on Tuesday 22nd April. We are only back 4 days before the final exams begin! Study club has been arranged for S4 -6 pupils from Monday to Wednesday 7th-9th April.